A background of rich green artificial grass with a cluster of 11 poppies, maple leaves and a bow of purple ribbon. An attractive spray with six poppies with maple leaves tied with a bow of purple ribbon. A background of rich green artificial grass with a cluster of four poppies, maple leaves. No ribbon. A solid base of green, with seven poppies and maple leaves, two large cycas leaves and a bow of purple ribbon. A solid base of green, with a cluster of three poppies and maple leaves, two cycas leaves, with a bow of purple ribbon. All ribbons can be personalized for an additional charge. 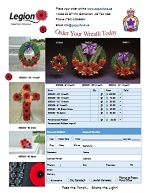 Click here to Download a price list and order form. Click here to order online using a credit card. Click here to order online without a credit card. 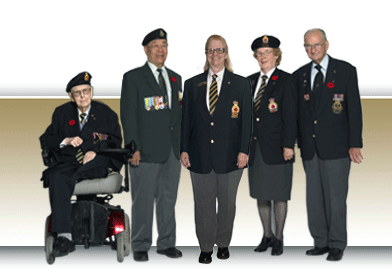 Remember - Wear a Poppy!